Spanning 70 years from the time of the Malayan Emergency in 1948 till now, little is recorded of the contribution of the Malayan and later, Malaysian Armed Forces, certainly not from the perspective of the local military. There are numerous publications and books on the Malayan campaign by the British forces but most of these narratives are of people looking in from the outside. It is time that local people who were directly involved re-count their experiences. The Malay regiment, Police Force, Special Branch, Federation regiment, Home Guards, Rangers and diferent corps of the Malayan Armed Forces contributed to the defence of the nation in the Malayan Emergency and later in Confrontation and Counter Insurgency warfare. Besides the Army, this book also describes the roles of the Royal Malaysian Air Force and Royal Malaysian Navy in the war and how the corps was established. Besides defending the nation, the Armed Forces also participated in many successful United Nation peacekeeping missions and local civic actions that benefited the public. The Malaysian Chinese Armed Forces veterans who contributed significantly in the early years decided to take the lead in narrating their experiences. There are two parts to this book. Part 1 is an introduction or preamble, that describes milestone events that occurred and Part 2 are personal experiences as narrated by the veterans. Two key elements in this book deserve attention - the narratives of the veterans who were in the events that occurred some 7 decades ago and the invaluable artefacts such as photographs, newspaper clippings and personal efects which act as time capsules, providing us with snapshots into their lives back then. As this book was taking shape, some of the veterans who contributed articles, have passed on. This memoir preserves their thoughts and records their journey. Pleaae contact the following persons if you are interested to purchase this book at the cost of RM70.00 not inclusive of delivery and postage charges. MACVA AGM Group Photo at Dewan Syarahan, PERHEBAT, Sungai Buloh Camp. Malaysian Armed Forces Chinese Veterans Association (MACVA) successfully held its AGM for 2019 at Dewan Syarahan , Kompleks Perbadanan Hal Ehwal Bekas ATM (PERHEBAT), Sg Buloh Camp, Sg Buloh, Selangor on 30 Mar 19. About 180 participating MACVs made the trip from Johore Baru, Melaka, Klang Valley, Ipoh and Penang to support the event. Sarawak Chapter MACVs with Maj Gen Dato' Toh Choon Siang and Brig Gen Datuk Johnny Lim Eng Seng. Sarawak Chapter MACVs attended the 1st Infantry Division Commander Handing Over Ceremony at Kem Muara Tuang, Kota Samarahan on 20 Mar 19. Maj Gen Dato' Toh Choon Siang who will be retiring on 17 Sep 19 handover his duty to Maj Gen Dato' Md Din Abu, the 27th General Officer Comanding (GOC) of the 1st Infantry Division (1 Div). Maj Gen Dato' Toh Choon Siang hold the record as the longest serving Chinese senior officer in the Malaysian Army and would have serve for 42 years 8 months and 9 days when he retire. He took over command as GOC 1 Div on 28 May 18. The handing over was witnessed by the 2nd Army Eastern Field Commander Lt Gen Datuk Wira Zamrose bin Mohd Zain. MACVA would like to wish Maj Gen Dato' Toh Choon Siang a happy retirement and Maj Gen Dato' Md Din Abu every success in his new command. Maj Gen Dato' Toh Choon Siang hands over command of 1st Infantry Division. Northern Chapter Inaugural Annual Meeting at Safira Country Club. MACVA Northern Chapter held its Inaugural Annual Meeting at Safira Country Club, Seberang Jaya, Penang on 17 Mar 2019. The meeting held from 3.15 pm to 5.15 pm noon were attended by 109 MACVs from the Northern region. The meeting elected the Committee Members for the term 2019 to 2020. MACVs from RMAF, RMN and Army were nominated/ volunteered for the posts showing great camaderie and comradeship. MACVA certificates were also distributed to attending MACVs who have not received them. The strong attendance bold well for an active Commitee that will serve the Northern region. Well done MACVA Northern Chapter. Meeting in progress. MACVs attending the meeting. MACVS visits Teh Lan Huat and Soo Heng Kuang. MACVS visits Tang Sung Eng, Chew Ah Soo and Choo Woh Soon. MACVA successfully held its 2019 AGM at Dewan Syarahan, Kompleks PERHEBAT, Sg Buloh Camp, Sg Buloh, Selangor on 30 Mar 19. SC MACVs attended the 1 Div GOCst Infantry Division Commander Handing Over Ceremony at Kem Muara Tuang, Kota Samarahan on 20 Mar 19. NC successfully held its Inaugural Annual Meeting at Safira Country Club on 17 Mar 2019..
MACVA paid a visit to the Malaysian Chinese Museum located at Seri kembangan, Selangor on 13 Mar 19. Kuala Lumpur MACVs delivered an Adjustable bed to Steven Kok while Northern MACVs visit Phang Beng San. 590 MACVs, spouses and guests attended MACVA 2019 CNY Dinner at the Unique Elite Grand Ballroom, Petaling Jaya on 16 Feb 18. 18 Feb 19 MACVS Received PJM In Recognition Of Service To The Country. 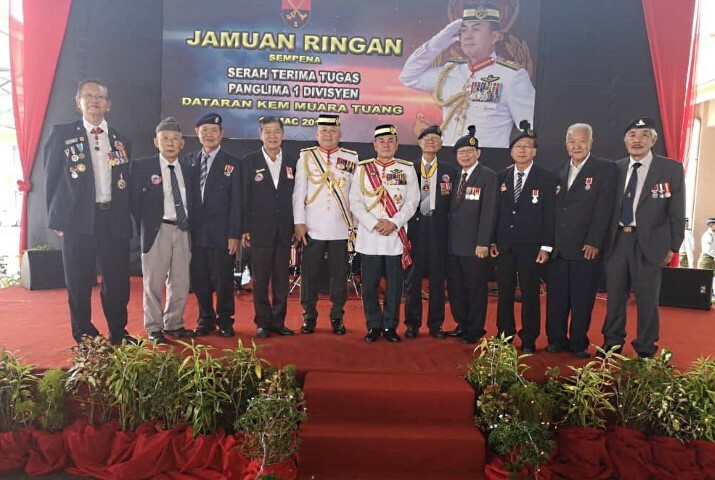 MACVS who served when MAF fought the MCP and the NKCP were conferred the PJM medal by the Chief of Defence Force Gen Tan Sri Dato’ Seri Panglima Hj Zulkifli bin Hj Zainal Abidin. WO II Wong Foh Lim (Rtd). A true brief story of my career in the Malaysian Armed Forces and never have I regretted it in my life. MACVS from NC attended a lunch gathering on 20 Jan 19 at Restaurant Sin Pao Siang in Sg Petani. MACVS visits Ang Siew San and Albert Phoon. MACVS visits Wong Hap Chye. MACVS visits Ambrose Yap, Edward Skading and Ung Eng Bee. MACVS visits Steven Kok and Goh Meng Foong. MACVS Lt Col Ir Raymond Goh Boon Pah (Rtd) and Maj Patrick Wong Sing Nang (Rtd) attended the 2018 MyStories Unsung Heroes reception. Defence Minister YB Tuan Haji Mohamad Sabu made a working visit to Kem Muara Tuang, Kota Samarahan on 3 Dec 18. MACVA participated in a Veterans Organisation Dialogue with JHEV Director General at Hotel Vivatel, Kuala Lumpur on 27 Nov 18. MACVS visits Oon Eam Seng and Daniel Ho. AM Sgt Mohamad Arbe bin Idris RMAF (Rtd) celebrated his 75 years birthday on 17 Nov 18. A total of 96 MACVS and wives attended his birthday celebration held at his home at Kg Subang, Shah Alam. A group of 37 MACVS attended the ceremony this year led by Northern Chapter Chairman Capt Tei Poey Eong RMAF (Rtd). MACVA members were in SMJK Sin Min, Sg Petani, Kedah on a Malaysian Youth Recruitment (MYR) Project. Some 30 MACVS and spouse attended a Remembrance Day Service held at Tugu Negara on 11 Nov 18 at 7.45 am. MACVA President and Committee Members meet up with Sarawak Chapter MACVS on a trip to Kuching recently from 1 Nov to 4 Nov 18. Sarawak Chapter MACVS attended the 2nd Army Eastern Field Commander Handing Over Ceremony at Kem Muara Tuang on 2 Nov 18. MACVS attended the RMAF Open Day held at Pangkalan Udara Kuching on 27 Oct 18. The group of 10 MACVS were led by VP RMAF Joe Pie Chong Seng. Northern Chapter held its 2018 RMAF/Tri-Services Annual Dinner at Kim Hee Restaurant, Pusat Perniagaan Seri Alma, Bukit Mertajam on 20 Oct 18. MACVS visits Kong Chee Chai and Bong Thu Kia. 18 Oct 18 Brig Gen Datuk Johnny Lim takes over as 31st Inf Bde Commander. Brig Gen Datuk Johnny Lim Eng Seng takes over as the new 31st Infantry Brigade Commander on 16 Oct 18. East Coast Chapter MACVS from around Kuantan had a fellowship get together on 6 Oct 18. In 1951, Home Guard was legislated to be organised in all states in Malaya, giving them responsibilities to look after strategic assets location. MACVA held its Mid-Autumn Festival Dinner at Hakka Restaurant, Kuala Lumpur where a total of 300 MACVS, friends and honour guest attended the event. MACVS visits Tan Teik Heng and Kang Hock Leng. Malaya committed 30% of it's Army to UN Operations ONUC at its peak and Lt Col Tan Siew Soo (Rtd) was privileged to serve 2 tours in Congo. Sarawak Chapter MACVS had a fellowship get together on 17 Sep 18 at Cafe Kim Hock Lim, Kuching where 22 Veterans caught up with each other. MACVS visits Moy Wah, Joachim Albert Kok and Tan Yow Fatt. During his stint onboard KD BADEK; Charles visited a number of neighbouring countries; to see the world part of the naval excitement for him..
27 MACVS and families participated in the AnakAnak Malaysia Walk 2018 which took place at the Eco Ardence Sales Galleries, Shah Alam. The 61st National Day Celebration was held at Dataran Putrajaya on 31 Aug 18. MACVS and wife attended the event. MACVS visits Chia Kim Fook and Choong Ah Chye. 29 Aug 18 MACVA In Support To Army Recruiting Drive For Chinese Youths. MACVA Members were in Sg Petani, Kedah today to lend support for the Army Recruiting Drive for Chinese Youth to join the Army. 24 Aug 18 MACVA Engage Chinese Press. MACVA meet up with China Press and Sin Chew Daily to highlight the Army Young Soldier Special Recruitment for Chinese. 24 Aug 18 MACVA Strongman Wins Silver at Barcelona. MACVS received Ng Chow Seng at KLIA on his return from Spain. Ng at 83 years old competed in the IWF 2018 Masters World Championship in Barcelona. On 19 Mar 17, MACVA held its first AGM where Maj Tan Pau Son (Rtd) was elected as the inaugural President for the period of 2017-2019. From his young days Maj David Chow Yun Kai (Rtd) has been a keen shooter. He did not like the 7.62mm SLR because it was slightly too heavy for him. Congratulations to Ms Mona Soh Poh Choo, daughter of WO1 Alan Soh Yean Heng RMN (Rtd) for her outstanding achievements in the nursing profession. Sarawak Chapter led by Maj Foo Ah Cheng (Rtd) organised a visit to 2nd Lt Ambrose Yap (Rtd) at Dr Ken Nursing Home in Kuching on 13 Aug 18. MACVS visit WO1 Ang Kok Bong RMAF at Cyberjaya, Selangor. MACVS attended the Anniversary Dinner at Lumut Navy Base on 11 Aug 18 and were represented by Veterans from all 3 services. 14 Aug 18 Family Homeland, Loyalty, Uniform - Part Two. 13 Aug 18 Chinese Youth Recruitment Meeting with CSM TD. MACVA had a meeting with CSM TD Team headed by Col Hassan bin Embong on 9 Aug 2018 at MACVA office at the Boulevard, Mid Valley City. 13 Aug 18 Family Homeland, Loyalty, Uniform - Part One. The “Soon” family line in Malaya started off from this very Soon Ah Yoong in his newly adopted homeland - Malaya. Ipoh Chapter MACVS had a fellowship get together on 3 Aug 18 at Canning Garden, Ipoh where 20 Veterans caught up with each other. 2 Aug 18 Remembrance Day At Tugu Negara. MACVA recently held a Remembrance Day in conjunction with the Hari Pahlawan 2018 at Tugu Negara, Lake Garden, Kuala Lumpur. MACVS visits Koh Ching Liang in Selangor and Ong Sui Lam in Penang. 25 Jul 18 The Sea Is Neutral. Yea, so it all began in the morning of February 1, a very long time ago in the last century. The date that I answered His Majesty’s calling. 24 Jul 18 Electric Wheelchair Assistance for Sim Boon Lee. MarV Sim Boon Lee received a brand new Electric Wheelchair which was presented to him at his house at Taman Alma, Bt Mertajam. 20 Jul 18 1st Infantry Division 52nd Anniversary Parade. MACVA Sarawak Chapter attended the 1st Infantry Division 52nd Anniversary Parade at Kem Muara Tuang, Kota Samarahan on 19 Jul 18. 19 Jul 18 The Allen Lai Story. Allen’s family comprise of 13 siblings; nine brothers; three younger sisters and an adopted sister. His late father; Mr Lai Ping Seong was a 2nd generation Malaysian Chinese. 18 Jul 18 YB Senator Liew Chin Tong as Deputy Defence Minister. MACVA would like to welcome YB Senator Liew Chin Tong as the new Deputy Defence Minister. 18 Jul 18 RMAF Veteran 2018 Annual Dinner. RMAF Veterans held its Annual Dinner at Sin Choi Wah Restaurant on 14 Jul 18 where about 350 RMAF Veterans, spouses and MACVS attended the event. 17 Jul 18 UiTM Merdeka Video Shoot. UiTM students from Shah Alam had a Merdeka Video Shoot session with MACVS at Darul Redzuan Museum in Ipoh on 16 Jul 18. 9 Jul 18 Thank You Note To MACVA. A letter of appreciation from the children of late MarV WO 2 Wong Tuck Moon RMAF (Rtd). 9 Jul 18 60th RMAF Anniversary Activities. MACVS attended the 60th RMAF Anniversary Parade at RMAF Subang Base on 5 Jul 18 recently where 27 officers, 609 airmen and airwomen were involved. 1 Jul 18 60th RMAF-RAAF Relations Anniversary. MACVS attended attended a joint parade at Butterworth Air Base to celebrate the 60th Annivesary of the RMAF-RAAF Relations..
21 Jun 18 MACVA Mock Cheque Presention to WO 2 Ng Chow Seng (Rtd). MACVA President Maj Tan Pau Son (Rtd) presented a mock cheque of RM11,000 to WO 2 Ng Chow Seng (Rtd) at MACVA office recently. 12 Jun 18 Sarawak Sabah Self Drive Tour – Team A Journey. An adventurous group of 8 MACVS and spouses completed a 17D16N Self Drive Tour from Kuching to Tawau promoting MACVA and signing up new MACVS along the way. The story of a Short Service Commission Officer Capt Tong Lye Heng (Rtd) and his good friend Dr Yong Boon How, a Professional Duty Officer. 5 Jun 18 MACVA Assistance to SSgt Tan Sin Kim (Rtd) and Sgt Ho Kim Kheong RMAF (Rtd). MACVS donated in an effort to assist Sgt Tan Sin Kim (Rtd) and Sgt Ho Kim Kheong RMAF (Rtd). MACVA congratulates Lt Gen Datuk Stephen Mundaw as the 2nd Army Eastern Field Commander and Maj Gen Toh Choon Siang as the 26th GOC of 1st Inf Div. 5 students from Tunku Abdul Rahman University College(TARUC) who aspires to be Reservists meet up with MACVS recently. MACVA would like to welcome YB Haji Mohamad Sabu as the new Minister of Defence. Hailed from Penang, he was born on 14th October 1954 in Tasek Gelugor. MACVA would like to congratulate Tun Dr Mahathir Mohamad for becoming the 7th Prime Minister of Malaysia. VP Army Maj Godfrey Chang (Rtd) visited Kuching recently and had a Dinner with local MACVS with spouses at Hornbill Restaurant, Sarawak Club. John was born on the 30 May 1942 in Serdang Baru, Sg Besi, Selangor. On 8 Dec 1961, he became a Cadet at RMC and joined the Regular Intake 6. MACVA held a Remembrance Day to pay respects to victims and heroes of the World War II in conjunction with Chinese Qing Ming observations. MACVS visits WO 1 Hor Wah Sim RMAF (Rtd) and F/Sgt Richard Thesara RMAF (Rtd). MACVA attended an Updates On Men's Health recently at HAT Tuanku Mizan Auditorium..
MACVA and HRD MINDEF participated in TAR UC Military Career Fair on 13 Mar 18 and Career fair on 20 Mar 18. MACVA was invited by the Chief of Airforce, Gen Tan Sri Dato' Sri Hj Affendi bin Buang TUDM to attend both historical events. MACVA Sarawak Chapter was invited by GOC 1 Div, Lt Gen Datuk Stephen Mundaw to attend the church service to commemorate the 85th Army Annivesary recently. MACVA recently held its association Chinese New Year Dinner in the Grand Ballroom of Sin Choi Wah Restaurant, Kuala Lumpur. Hosted by the Chief of Defence Force, more than 150 MACVS, spouses and Chinese Veterans attended the event. MACVS visits WO 1 Hor Wah Sim RMAF (Rtd) and Cpl Goo Pim Kim RMAF (Rtd). About 150 RMAF MACVS visited KL Air Base for a Memory Walk on 6 Feb 18. It was a nostalgic visit by all who have served in the base during their RMAF career. Charles joined the RMN on 21st June 1954 as Officer Cadet, and was allotted the SN: N/400073, the fourth SN for officers in the RMN’s history. A Civil Action Task by the Malaysian Army Royal Regiment of Engineers for the Conservation of Wild Life to the Nation. The Malaysian Army celebrated its 85th Army Day on 1 Mar 18 with a parade at the Army Basic Training Centre (PUSASDA), Port Dickson. MACVA visited patients at HAT Tuanku Mizan on 28 Feb 18 to share the greetings and joy of the Chinese New Year with them. MACVA successfully held its 2018 AGM at 11 Bde Officers Mess, Sg Buloh Camp, Sungai Buloh on 24 Feb 18. MACVS visit WO 1 Tay Yoke Sing (Rtd). MACVS visits Maj Lee Kong Kok (Rtd), Lt Goh Kim Bah RMN (Rtd) and David Mak Chill Hoong. MACVS visits Rear Adm Dato' Mohd Som RMN (Rtd) and PO Ismail RMN (Rtd). MACVS visits WO 2 Chang Yu Kuan (Rtd) and MCPO Patrick Chua Boon Heng RMN (Rtd). Maj Patrick Wong Sing Nang (Rtd) was conferred the “Kepujian Perutusan Keberanian” (KPK) on the 15th of September, 1979. MACVA has today call a Press Conference in reponse to the speech made by Ismail Mina Ahmad on 13 January 2018. 2nd Lt David Fu (Rtd) was conferred the “Pingat Gagah Berani” by the King on 2 Jun 1971 for valour in the face of the enemy. MACVS visits Lt Paul Kwong RMN (Rtd) and Sgt Ronnie Kong Chee Chai RMAF (Rtd). A true pioneer in the formative years of the RMN, he was born in Ipoh and his early education in St. Michael’s Institution.